We take a look at one of the more popular soft-sided travel pet carriers on the market at the moment. Combining comfort with security is always an issue for dog and cat owners, so finding a good carrier is vital. The Pawfect soft-sided travel pet carrier looks a little like traditional hand luggage. Indeed, at first glance, it could easily be mistaken for a sport’s bag. For infrequent travelers, it’s a good option because it flattens down and is easy to store away in a drawer or cupboard when not in use. Finding a pet carrier that is both reliable and durable is often a problem for pet owners. Ideally, you want something that will last for a long time but which your cat or dog, or another pet, is happy to sit inside. For longer journeys such as flights or cross-country drives, this is even more important. It’s hard to find a pet carrier that ticks all the boxes and does everything you need. We’ll take a much closer look at the PawPerfect Travel Pet Carrier in our review, see what customers are saying about it and highlight the good and bad points. CLICK HERE to Find Out What People are Saying or Get Pricing Info on Amazon! 1.1 Who Are Pawfect Pets? You might be surprised to find a pet carrier that comes with a lifetime replacement guarantee. The most you get with other products is a two or three-year guarantee, and that comes with some pretty steep caveats. 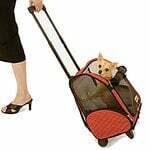 The Pawfect Travel Carrier is one of the few we’ve seen with this sort of guarantee. This is an airline approved carrier which means it should be suitable for taking onboard cabins for internal US flights. Because of the soft sides, you can normally fit it quite comfortably under your seat. You may want to check if it fits the bill for international flights, however, as these tend to have a different set of rules. If you prefer your pet carrier to look like a proper bag, the PawPerfect Travel Carrier is not going to disappoint. It’s designed for small dogs and cats and only comes in one size. For miniature dog owners, it provides just about the right amount of space and comfort. There are limitations for this pet carrier as it’s aimed at a specific type of pet owner. While there’s only one size, it does provide the safety, comfort, and security that many small dog owners are looking for. With so many pet products on the market nowadays, it’s good to see a small, US company doing well. Pawfect Pets produce a range of products from carriers and feeders to pet bowls. Their focus is always on high quality and innovation at an affordable cost, and they always test their products in-house before releasing to the public. If you’re looking to mix and match with your own style, you may be a little disappointed at the color range and size. If, on the other hand, you want something that works, you may not be bothered by that lack of choice. There is only one size available currently. 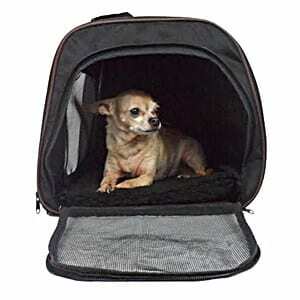 This travel pet carrier measures 17.7 x 12.2 x 11.8 inches and is suitable for use on flights (it is actually at the largest end of the spectrum when it comes to allowable size). The pet carrier comes in three different colors: charcoal gray, blush tan, and navy. For a pet carrier that would be a good choice for you if you have an escape artist on your hands, you might want to have a look at the Petmate Vari-Kennel Plastic Dog Crate. This is a hard-sided crate. Most pet carriers tend to have a tradeoff between what you need and what you’d like. This is a good quality pet travel bag if you have a small dog or cat and need to travel long distances. It’s been designed with flight travel in mind too. That means it should meet current internal US rules and regulations, though you should always check beforehand. Here’s a quick look at what we found to be good, and bad, about the Pawfect Pets Soft Sided Travel Pet Carrier. This does at first glance look like a high-quality pet carrier for small dogs and cats. The microfiber material looks and feels just right, and there is a soft, removable fleece provided. The base is firm without being too hard and is suitable for smaller pets. While it looks substantial, it’s also easy to flatten down and store like any soft sided hand luggage. It’s easy to clean, and the fleece bed is machine washable. You have zippered openings front and back as well as on top. The top opening will suit cat owners who find it easier to put their pet in an enclosed space like this. The mesh panels mean that you meet requirements for airlines and give your dog or cat full ventilation. The carry strap comes with a Velcro closure which makes for more comfortable and safer carrying. You also get a shoulder strap which you can add to the bag, and there’s a zipper pocket for leads and other personal effects. It is only available in one size, something the manufacturers may want to think about. Because it’s made of microfiber and has mesh windows, this is not a suitable carrier for aggressive or easily frightened pets. They are likely to claw or bite their way through the mesh. This last point is important for anyone considering buying a dog or cat carrier, particularly for use on flights. Some animals don’t like confined spaces so picking the right material is important. While some pets might be fractious, to begin with, a bit of careful training and patience can generally put them at ease. If you have issues about your dog or cat biting and chewing the carrier, however, you may like to switch to something more robust. 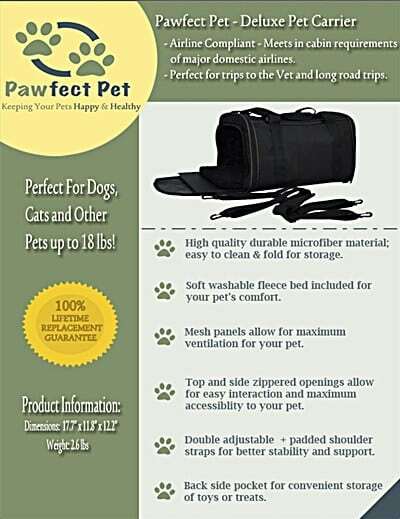 CLICK HERE to Buy the Pawfect Soft Sided Travel Pet Carrier on Amazon! This is a good carrier for anyone who owns a small dog like a chihuahua or a cat. It can be used for a variety of purposes, including going on flights and for long car journeys. It’s also a suitable pet carrier if you want something for occasional visits to the vets. Some animals are more ingenious than others. There’s always the chance that they might find a way to escape. The good news about the Pawfect Pets Carrier is that it seems virtually escape proof! Taking your pet outside in a carrier can be a stressful experience. Ideally, you want a good quality carrier that they will easily get used to over a short period of time. We took a closer look at what customers are saying online about this particular product, the good points and the bad. The overall response seems to be that this is an outstanding quality pet carrier at a very affordable price. 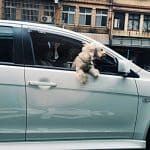 If you have a dog that is reasonably easy to train, it’s simply a matter of getting them used to the carrier before you go on a journey. You should, according to most buyers, be doing this at least a couple of weeks beforehand. This is about near the top range when it comes to the size allowed in cabins on airlines. The reason is that they generally have to fit under seats. Customers like the slightly larger size because it gives them more leeway and doesn’t leave them with a carrier that is too small. The fact that it is made of soft material also seems to be a good buying point. While it’s rigid enough, it’s also flexible, and you can fold the bag flat after you have finished using it. That makes it easy to store away when you don’t need the carrier. One issue that was pointed out is that the pouches don’t have zippers or Velcro on them. Some customers felt this made them a little less secure for storing small items. It’s something that Pawfect Pets might like to look at in future designs. Some customers were a little worried that the top collapsed a little during transit, but this is normal for any soft-style carrier. Customer service was also praised by some buyers when things went wrong. One customer received the product, but it didn’t have a shoulder strap included. They emailed Pawfect Pets, and the strap was sent through in a couple of days. There are a lot of things to consider when you are buying a travel pet carrier. Not only do you want to find good value for money but also get a product that is both durable and fit for purpose. The Pawfect Pets Soft Sided Travel Pet Carrier has certainly gained plenty of positive reviews. You should buy it if you are looking for a quality carrier that you can use on long journeys and particularly flights. It passes all the rules and regulations for most internal USA flights. You have the option to carry this bag using the handles or a shoulder strap. When it’s not being used, you can fold the carrier away and store it in a drawer or cupboard. 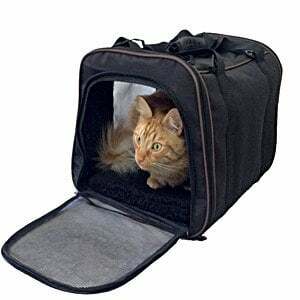 If you are looking for a soft-sided pet carrier that fits the job of getting your favorite dog or cat safely from A to B, this product is well worth considering.